With the healthcare reform debate at full throttle, the nonprofit Foundation for Health Coverage Education and AOR Haese & Wood Marketing and PR continued to drive its public advocacy campaign. With the healthcare reform debate at full throttle last year, the nonprofit Foundation for Health Coverage Education (FHCE) and AOR Haese & Wood Marketing and Public Relations continued to drive this ongoing public advocacy campaign by expanding partnerships and outreach. 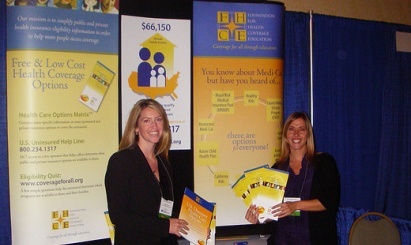 FHCE provides health insurance eligibility information and ultimately aims to reduce the number of uninsured Americans by educating people about private programs for which they might qualify. Lebherz explains that the team sought to strengthen existing relationships and establish new ones, as partnerships drive referrals to FHCE's CoverageForAll.org and its Help Line call center. Media relations, including radio and TV PSAs, and social media outreach also drove awareness. Existing partners include other national nonprofits, such as American Cancer Society and the American Heart Association; brokers; employment development departments; insurance companies; hospitals; and various state and federal departments. Training webinars were held in April and May with partners. The team also reached out to various other organizations, including The Society for Human Resource Management and the California Workforce Association, and attended consumer related conferences. Media targets included healthcare trades; general assignment and medical reporters; healthcare business reporters; consumer advocate reporters; and public affairs radio and TV talkshows. Press releases, bylined articles, and radio and TV PSAs (in English and Spanish) were distributed. Haese notes blogger outreach was limited due to concern about FHCE being perceived as taking sides in the healthcare debate. Select mommy bloggers were targeted. FHCE launched Facebook and Twitter pages in late 2009, and an iphone app launched in early 2010. Social media posts included news from health coverage organizations and updates on healthcare reform legislation. Lebherz reports that more than 1 million people visited the website or called the Help Line in 2010, compared to 1 million total in the previous five years. She also reports 3.3 billion media impressions garnered since 2005. Outlets covering the story in 2010 included USA Today, The Wall Street Journal, US News & World Report, CNN, NBC, and MSNBC. Since October 2009, FHCE has gained 214 Facebook fans and 257 Twitter followers. In 2010, the Eligibility Quiz was taken 474 times through the App, which includes individuals who downloaded the app and then utilized the program more than once on different occasions. Haese says the team will continue strengthening media relationships while increasing YouTube and social media outreach.